Amongst this year’s FrightFest revivals was Arrow Films’ restoration of Giulio Paradisi’s (billed here, rather wonderfully as Michael J. Paradise) bonkers sci-fi horror; a spin on The Omen pitting the descendant of an intergalactic Nazi hunter against the latest strain of a despotic space criminal’s genes – evil eight year old Paige Connor. Are these otherworldly beings what we call God and the Devil? If the fudge-thick symbolism’s anything to do by, yes, but don’t worry if it isn’t clear – this isn’t the kind of film to get bogged down in details. 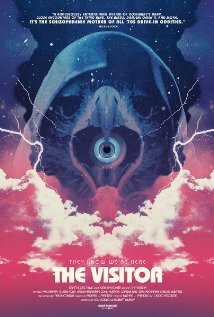 If the premise is hard to swallow, the cast beggars belief – John Huston, Lance Henriksen, Glenn Ford, Sam Peckinpah, Shirley Winters – it seems anybody who was anybody was lining up to be a movie featuring Franco Nero’s cosmic Jesus, a demonic eagle, an impregnation clinic built into a futuristic truck and death by ice rink. We may never know what all concerned thought they were getting into but the result’s a spaghetti b-movie that reacquaints modern viewers with old pleasures like the conspicuous overdub and incongruous score (the full-blooded compositions of Franco Micalizzi). It’s a visitor from another world of filmmaking. Just as westerns like Django borrowed shamelessly from their American counterparts and added lashings of stylised photography and violence, in keeping with Italian directors’ penchant for heightened reality, vivid imagery and high-end schlock, The Visitor, patterned on Richard Donner’s aforementioned horror, goes all out to grab the audience’s attention, from the dream-like opening on an alien vista to standbys like a character being defenestrated in slow motion. The results are creepy and hilarious in equal measure, some scenes so overwrought you rub your eyes, some dialogue so creaky, having the feel of English written by a man who wasn’t verbally dexterous in that tongue, you tap your ears. Meanwhile, the film is gloriously muddled. “You’ve been a special help to me,” says Huston to housekeeper Shirley Winters in one scene, leaving us scratching our heads as to what Winters did, beyond standing idle as problem child Katy pushed her wheelchair bound mother into a giant fish tank. Production methodology, the soundtrack recorded in a studio, and re-recorded for international release, gives the film its uncanny quality. The actors don’t seem to be there, either aurally or mentally; they’re as bemused as we are, while the movie’s many curious elements – the demented plotting (evil forces arrange for Katy to get a loaded gun as a birthday present), left field religiosity and flashes of greatness (Katy cracking mirrors with her mind in a hall of the same is enjoyable stuff), give us the feel of a movie made by a cult: their version of the greatest story ever told. A fine late night movie then, and one every aficionado of the absurd should seek out.